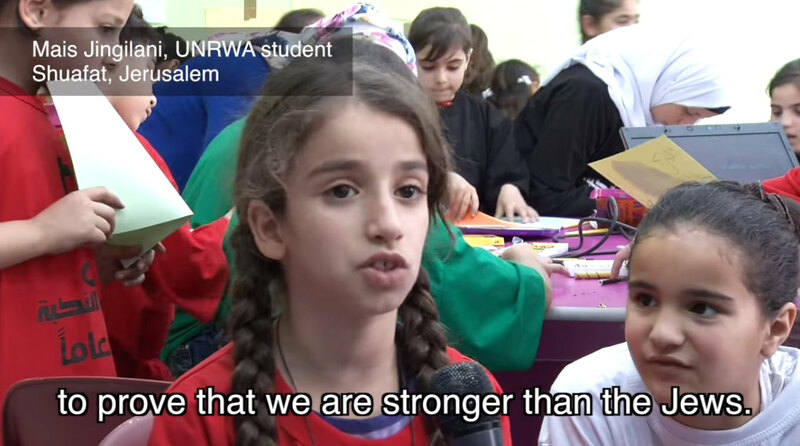 UNRWA was created almost seventy years ago and has evolved into the UN's single largest arm, employing more than 30,000 staffers. Fully 99% of that hugely blown-up total workforce is made up of locally recruited Palestinian Arabs, says Wikipedia. So long as the mind-numbing, ongoing flow of cash and diplomatic coddling keeps on, UNRWA will not slow down - or achieve any of the goals which it was created to pursue. But in reality, those goals, essentially short-term and temporary, were abandoned decades ago. Temporary fixes are often the most permanent of structures. Yes. 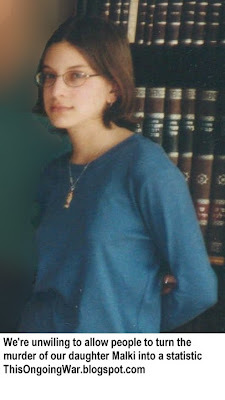 If you had lived there for 23 months, you were entitled to UNRWA support (pensions, allowances, food, clothing, basic household items, schooling, psycho-social activities, health services, shelter, welfare services) for life, and so are your children, and their great-great-great-great grandchildren until forever. The UN incredibly defined Palestinian Arab refugee status as something you inherited... in perpetuity. So then how surprising is it to know the number of Palestinian Arab "refugees" has been exploding for decades? How could it not? 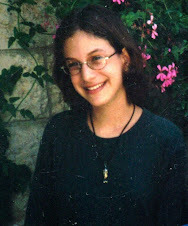 And why would a Palestinian Arab family ever admit to a family member having died or succeeding in life? Having multiplied itself by a factor of nearly six in these 6+ decades of furthering "conditions of peace and stability" and of funding by others, does anyone imagine this number of beneficiaries is going to get smaller? Ever? There is no doubt at all that it is going to keep ballooning and unless UNRWA is forcibly stopped so will the problems it has created. 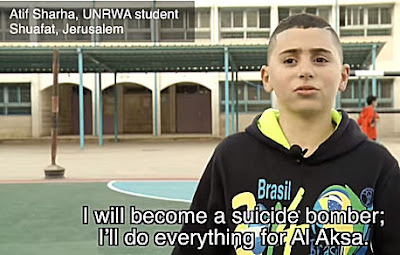 Yet on one perfectly reasonable view, UNRWA has succeeded. A large majority of those Palestinian Arab refugees live today in homes unconnected to refugee camps, reside in one of the two Palestinian Arab statelets - the one based in Ramallah, the other in Gaza - under Palestinian Arab control, or hold citizenship in various countries. Needless to say, if you have been following the scandal down through the years, UNRWA and its fans don't see this as success. Or as reality. They invest serious energy in endlessly reframing the catastrophe so that it's about homeless, hopeless refugees, totally dependent on charity, driven by endless yearning for a lost homeland (the one that served many of them for 20 months), and always, but always, needing more cash. So given that the UN operates two parallel but very separate refugee agencies with massively different per capita resource deployment (obviously favoring UNRWA), who pays for the Palestinian Arab one? The obscenely wealthy Arab oil potentates, perhaps? Or the Qataris who will host the 2022 FIFA World Cup and are spending, as The Guardian memorably reported half a year ago, $200,000,000,000 on soccer stadiums and other essentials? 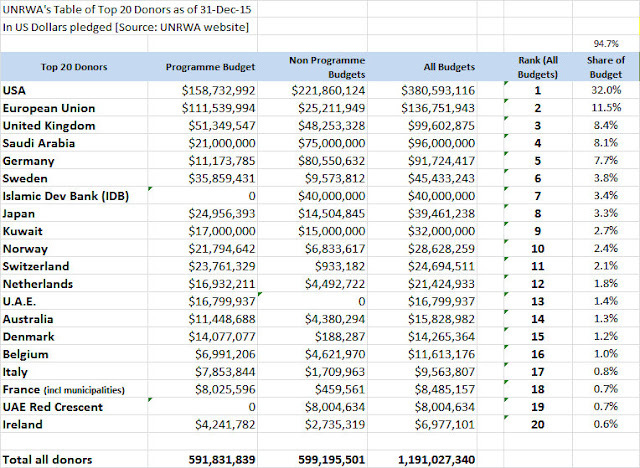 We published a table of UNRWA's main donors based on 2013 donations [source] a while back ["04-Jun-15: Exploding for decades: UNRWA needs more, more, more"] while explaining that its funding is perpetually in crisis. It listed the Top 20 contributors to UNRWA for that year, and showed that the Arab donors in the Top 20 contributed 16.1% of what the entire Top 20 gave. Earlier, the 2012 UNRWA donor table [here] showed Saudi Arabia on the list as the sole Arab donor. And earlier still, the 2010 numbers [here] showed not a single Arab donor in the Top 20 list, and this after more than sixty years of UNRWA activity. The overall sum pledged (not received - they don't yet know that number) is $1.2 billion. 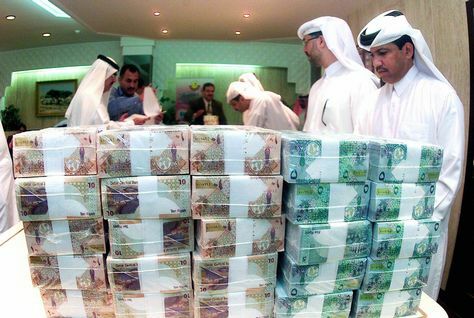 Of this, all the Arab donors - countries, princes, sheikhs, oil potentates, banks - taken together provided 13.4% of the total. It follows that non-Arab donors are providing 86.6% of the budget - and that's before we get into the sordid matter of countries who pledge but don't pay. The Arab donors contributed about 13.5% both on a Top 20 basis and on a whole-donor-list basis. That's a significant decline, percentage-wise, over the 2013 numbers. We think the video clip we showcased in another post of ours ["30-May-16: Listen to the children to understand who is weaponizing them and how [Video]" produced by The Center for Near East Policy Research just a few days ago gives a good sense of what UNRWA donors are getting for their donations - in business terms, their return on investment, or ROI. (Check out the additional background on the YouTube page that hosts the clip). Though the video runs for less than ten minutes, it turns the turgid prose - and figures - above into very uncomfortable realities. 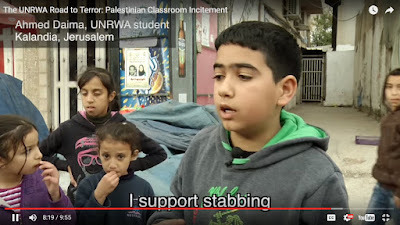 It also puts faces and voices to the hundreds of thousands of child-victims of the appalling UNRWA, a self-praised United Nations agency with a track-record of destroying lives, as we explained just last week here: "30-May-16: Barbarism, bigotry and blood-lust: What a UN-provided education delivers". This is a humanitarian disaster, one that far too many prominent politicians and diplomats prefer we don't comprehend or see. 19-May-14: Will momentary focus on UNRWA throw any light on PA and Hamas abuse of their own people? 19-Jun-13: We actually do understand why Arab states put almost no money in the Palestinian Arab "refugee" fund pot. We just don't get why the US does.